“Dancing With the Stars” beat “The Voice” among total viewers last night — the first time that’s happened this season — when apparently the youngest and oldest NBC fans were out Trick-or-Treating. Still, NBC and its key singing competition were the top broadcast choices among those 18-49, which is really what the advertisers care about. CBS actually topped ABC among that main demographic on Monday. To be fair to “The Voice,” pretty much everything was predictably down last night, though to differing degrees. NBC was first in ratings with a 1.7 rating/6 share in the advertiser-coveted 18-49 demographic and second in total viewers with an average of 8 million, according to preliminary numbers. “The Voice” at 8 p.m. put up a 2.0/7 and 9.3 million viewers. At 10, “Timeless” got a 1.1/4 and 5.3 million viewers. CBS was second in ratings with a 1.4/5 and third in viewers with 6.4 million. “Kevin Can Wait” at 8 had a 1.4/6 and 6.8 million viewers. At 8:30, “Man With a Plan” got a 1.5/5 and 6.7 million viewers. At 9, “2 Broke Girls” received a 1.5/5 and 5.8 million viewers. “The Odd Couple” at 9:30 managed a 1.2/4 and 5.1 million viewers. At 10, “Scorpion” closed primetime to a 1.4/5 and 7.4 million viewers. ABC was third in ratings with a 1.2/4, but first and in viewers with 8.4 million. “DWTS” at 8 landed a 1.5/5 and 10.3 million viewers. Special “All Access Nashville: Celebrating the CMT Awards” followed at 10 with a 0.7/2 and 4.6 million viewers. Fox was fourth in ratings with a 0.9/3 and in viewers with 3.2 million. “Gotham” at 8 posted a 0.9/4 and 3.1 million viewers. At 9, “Lucifer” matched that rating/share, but added about 400,000 total viewers. Telemundo was fifth in ratings with a 0.6/2 and sixth in viewers with 1.54 million. The CW and Univision tied for sixth in ratings, both with a 0.5/2. CW was fifth in total viewers with 1.6 million, Univision was seventh with 1.49 million. For CW, “Supergirl” at 8 had a 0.6/2 and 2.2 million viewers. At 9, “Jane The Virgin” ended up with a 0.4/1 and 1 million viewers. Let's kick this whole thing off with a group shot from "The View." Click through our gallery for individual and group shots from that show and others! Here's Ringmaster Rachael Ray and her lion tamer husband, John Cusimano (their dog was the big cat). The Trump Family on "Live With Kelly." Kelly Ripa is both Donald and Melania Trump; "Live" production exec Art Moore is Ivanka. And the Clinton Family on "Live With Kelly." Jerry O’Connell is Hillary and Bill Clinton, Art returns as Chelsea. "The View" moderator Whoopi Goldberg dressed up as Marge Simpson on Monday. And here's big "Inside Out" fan Joy Behar keeping her emotions in check. Paula Faris was My Little Pony ... we think. 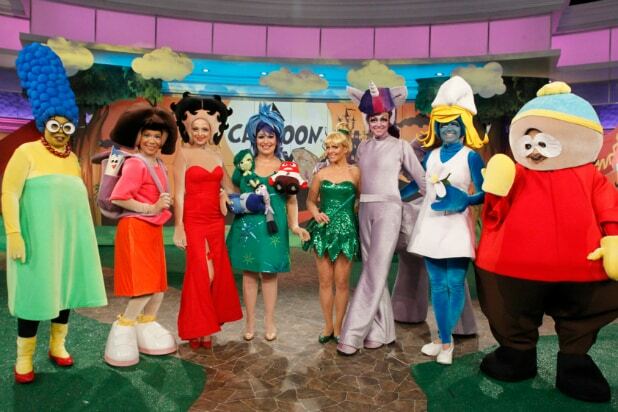 Sunny Hostin as Dora the Explorer. Jedediah Bila got her Betty Boop on for "The View." Candace Cameron Bure took flight as Tinker Bell on "The View." Sara Haines blue herself, Smurfette-style. Raven-Symone dressed up as Eric Cartman from "South Park" for what will be her final Halloween on "The View." Amy Robach went weird as Sia on "Good Morning America." "Good Morning America" goes "Suicide Squad." Here's a group shot from "GMA." Al Roker did that as Steve Urkel on "Today." Carson Daly in his "TRL" heyday. Carson Daly is back as The Terminator. Jenna Bush Hager as former First Lady Barbara Bush. It probably wasn't too hard for her to get the outfit. Kathie Lee Gifford and Hoda Kotb as "Live With Regis and Kathie Lee" hosts. Matt Lauer doesn't want to be a pirate as Jerry Seinfeld. Savannah Guthrie bares all (sort of) on "Today." Charlie, "Today's" puppy with a purpose as a Beanie Baby. Nice Madea costume, T.J. Holmes! Tyler Perry would call in. Pikachu Michael Strahan does the "Pokemon Go" thing. Jesse Palmer is Captain America, with Lara Spencer as Alexander Hamilton. Natalie Morales as Miley Cyrus and Kit Hoover as Dolly Parton on "Access Hollywood." "Fox & Friends" hosts join up as a "united" United States of America. Aisha Tyler looks just like Lionel Richie on "The Talk." Sharon Osbourne continues the throwback karaoke theme as Marilyn Monroe. Sheryl Underwood poses by the piano as Little Richard. This is Julie Chen as Madonna, just trust us. "The Talk's" Sara Gilbert entertains some sailors as Cher. Here's the "Chew" crew: Daphne Oz as Peg Bundy, Carla Hall as (another) Steve Urkel, Clinton Kelly as Zach Morris, and Michael Symon as Lucy Ricardo. Kelly Pickler dreams of a good meal on "The Chew." Drew Carey is a "Price Is Right" superfan, and this superfan is Drew Carey. Will the real Michaela Pereira please stand up? CNN's Sara Sidner and Stephanie Elam dressed up as their favorite HLN personality. On, and that's executive producer Scott Warren stuck in the middle. ...and then she donned the Wonder Woman outfit. It was all part of a Charlie's Angels tryout-themed sketch, to help explain the signage. Don't be sad, pumpkin pug -- Halloween will be back again next year.